The two Islamist figures were facing trial on charges of detaining and torturing two policemen at the Rabaa Al-Adawiya sit-in supporting ousted president Mohamed Morsi. Security forces cracked down on the Muslim Brotherhood following the dispersal of two main pro-Morsi sit-ins in Cairo and Giza on 14 August. Thousands of Brotherhood members were arrested in the aftermath. Hegazy, who was also media advisor to the Brotherhood's Freedom and Justice Party, was arrested 21 August en route to Libya. Hegazy has been one of the most prominent supporters of Morsi and the Brotherhood. He was known to be present in the pro-Morsi Rabaa Al-Adawiya protest camp where he voiced highly controversial statements on the Brotherhood's opponents. Senior Brotherhood leader El-Beltagy was arrested 29 August in Giza. El-Beltagy's daughter, Asmaa, 17, died during the crackdown on 14 August. On 7 August, Hegazy along with El-Beltagy and two field-hospital doctors, were referred to criminal court for allegedly attempting to detain and assault low-ranking police officer Mohamed Farouk during a pro-Morsi march in July. 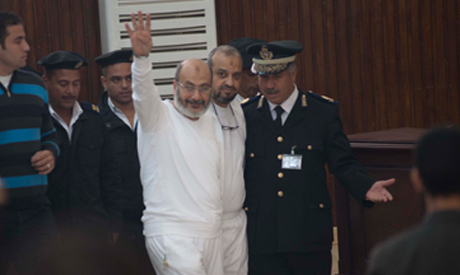 In court, Beltagy and Hegazy raised the four finger "Rabaa" sign (a gesture of solidarity with the victims of 14 August and in support of Morsi) and chanted against the military and the judiciary.